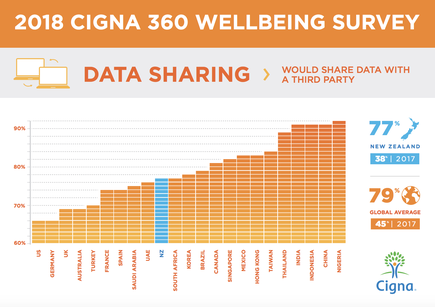 Across the globe, including New Zealand, people are highly open to health data sharing with third parties if it lowers healthcare costs, provides better access to healthcare and enables early detection, according to a new survey by Cigna. Next to doctors and government-run health databases, people are open to sharing their health data with insurance companies and communities with similar medical conditions, according to the Cigna 360° Well-Being Survey. But while the global average is 79 per cent (or eight out of 10) for people who are willing to share their healthcare data, the New Zealand figure is slightly lower, at 77 per cent. Compared with a year ago, the increase in the percentage of respondents willing to share their health data has also risen dramatically. Last year, the figures were 38 per cent in New Zealand, and 45 per cent globally. One trend observed this year is that some countries, like India and China, are high in their acceptance of sharing their data with third parties, while countries like US and Germany are more wary. 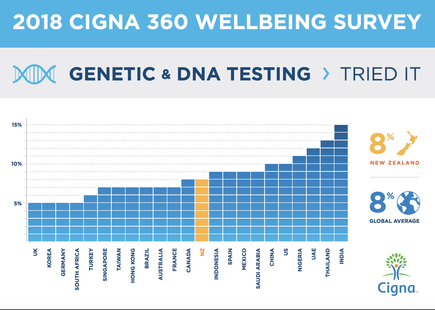 Now on its fourth year, the Cigna 360 Wellbeing Survey Report, monitors and tracks the annual evolution of key emotional and psychological wellbeing indicators across 23 countries. With New Zealand, there is a variety of responses on who they will be prepared to share their data with. The survey finds 59 per cent of Kiwis will share their data if an organisation is “transparent”, or will explain how and why they are using the data. Less than a fifth of Kiwi respondents(17 per cent) say they will share more data if they knew what the purpose was, while 16 per cent are fine with sharing data through wearables. As to their views on genetic and DNA testing, New Zealanders are at par with their global counterparts in having tried these tests. “The findings show us that there is an opportunity for the health services and insurance industry to create solutions that are customised and affordable for each individual, says Jason Sadler, president, Cigna International Markets.